This page on music theory key signatures will focus on the theory. Here we'll talk about the Circle of 5ths and the Circle of 4ths. Don't know what those are? Don't worry. It just a name of a pattern to help you to understand key signatures. You can also learn some ways of remembering key signatures and the theory explained in a different way on the main key signatures page. The circle of 5ths is the name of the pattern for the key signatures with sharps in them. It refers to the order of the keys - from C (no sharps) to C# (7 sharps). Basically what you do is count up 5 notes from the last one. For example: C has no sharps and flats. We want to know what key has 1 sharp - the next in line. So we count up 5 notes starting with C. C-D-E-F-G. G is the 5th note and it is the key with one sharp. To find the key with 2 sharps, you count up 5 notes from G. The next one is D. This keeps going. Be aware however that 5 notes up from B will be F# not F. And after F# is C#. So to learn music theory key signatures it's very helpful to be aware of the circle of 5ths. If you need to know the order of the sharps that go in those key signatures, you can use this saying: Father Charles Goes Down And Ends Battle. (The first letter of each word stands for a sharp). You might notice that all of the sharps are also 5 notes apart and you can remember them that way. Just start on F#. 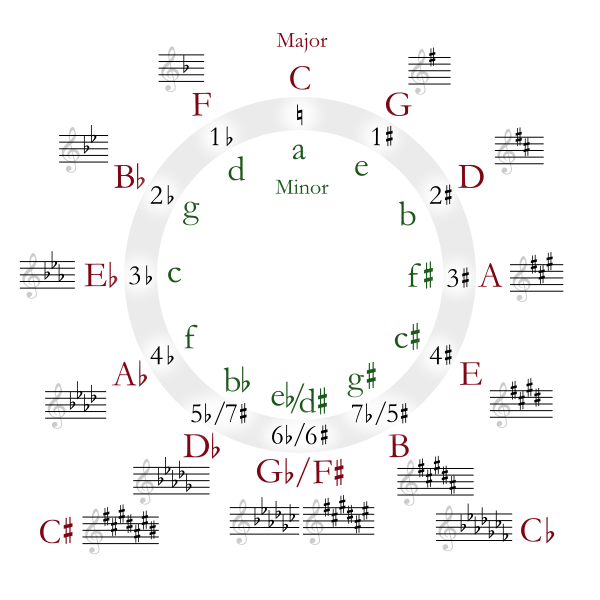 Another great resource for seeing the circle of fifths here. The circle of 4ths works for the keys with flats in them. The circle of 4ths is just like the circle of 5ths only you're counting up 4 notes instead of 5. The other thing to be aware of is that after F, every note in the circle of 4ths will be a flat. For example, starting with C (no flats), when you count up 4 you reach F. After F is Bb. After Bb is Eb. Every note is 4 notes higher than the last one. The order of the flats is this: BEADGCF. I remember them by making the first 4 flats spell the word "BEAD" and then remember the GCF. Every flat is 4 notes apart also. Just start with B. If you need a quick reference to where the go on the staff, here are the pictures for the sharps and the flats. As far as music theory key signatures go, if you can remember the Circle of 5ths and the Circle of 4ths, you have a really good handle on things. If you want to know more about the theory, check out the main key signatures page for more information. Return from Music Theory Key Signatures to Piano Lessons Info Homepage.